In a bowl, mix your cornflour, water, salt, pepper, lime juice and chilli powder together. Use a food processor to blitz the squid and fish and then gradually pour in your cornflour/spice mixture. You’ll end up with a fishy paste, which you should transfer to a bowl and then your spring onions. Wet your hands with some water (and oil if you want but I didn’t), you’re meant to squeeze the fish mixture through your thumb and index finger to create a little ball. 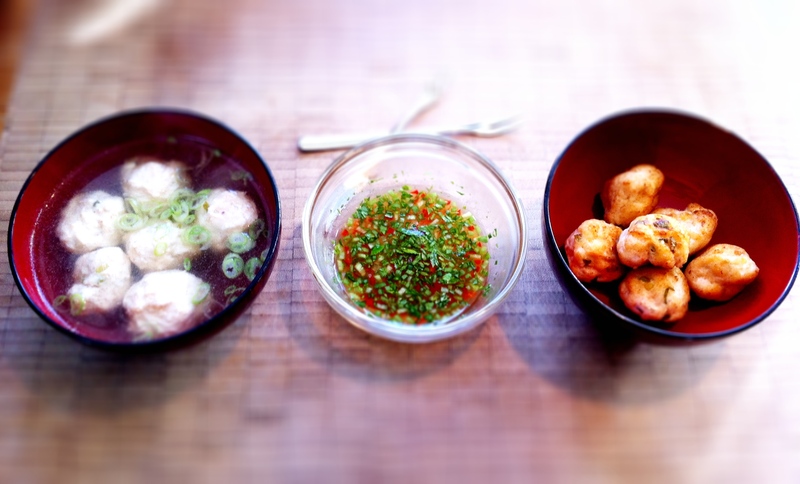 I just used a teaspoon and my hands to roll roughly shaped fish ball (it worked out to about 1 tablespoon of fish mixture for each fish ball). Drop these into a bowl of salted water and leave them for 30 minutes. Boil up a pot of stock (I just made a broth using 2 tamarind stock cubes to 1.5 litres of water) and drop your fish balls into the stock (turn the heat right down to low). Your fish balls will start to float when they’re cooked. Once they started floating, I turned the heat back to high to bring the broth up to the boil just for a minute. I also fished some out when they were cooked and shallow fried these in a teeny bit of oil. They taste fantastic when they’re deep fried but I’m trying to be healthier and lose weight so I stuck to shallow frying them just to brown them up a bit. I made a dipping sauce with ingredients I had but you can eat these dipped in whatever you like – soy sauce, sweet chilli sauce, ketchup, mayo – your choice!